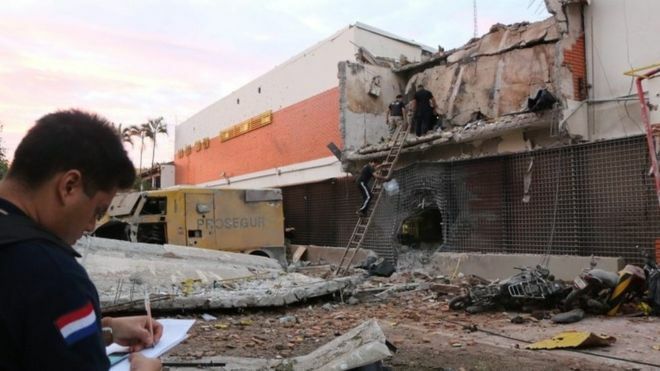 Earlier on Monday about 50 men moved into the Paraguayan city of Ciudad del Este, blew up the front of a private security firm, and fired on police. Unconfirmed reports suggest they could have stolen up to $40m (£31m; €37m). After the robbery, the gang created a diversion by burning cars and attacking the local police station. They escaped after a two-hour shootout that left one police officer dead at the scene after the company’s vaults were blown up. Police believe they fled in several of the security company’s armoured trucks and then may have transferred their booty to waiting boats at the Parana river. They were believed to have travelled 50km (30 miles) downriver to a region called Itaipulandia in Brazil, were they were intercepted by Brazilian police. 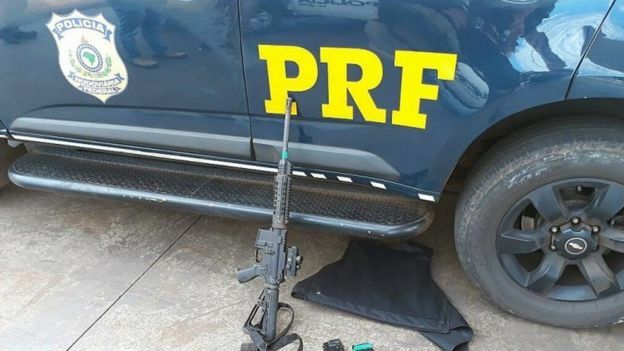 Brazilian federal police came across 12 men who exchanged fire and then escaped, Brazilian Globo website reported. The men left guns, ammunition, flack jackets and explosives in the car they abandoned, police said. A large security operation is under way to try to recapture the gang on both sides of the border.